2014 Cadillac CTS Pros and Cons: Why (Not) This Car? Cadillac once ruled the North American luxury car market. Today it is outsold by three German and Japanese competitors. In an attempt to regain lost ground, General Motors has pursued a dual strategy. Two models in the Lexus idiom employ front-wheel-drive platforms to attract the mainstream luxury buyer. Meanwhile, two others (with a third on the way) seek to beat BMW at its own game. The 2003 CTS was the first full expression of the latter strategy. For 2014 the third generation of this now clearly midsize sedan might well have achieved its primary objective. But at what cost? Red/black interior adds $1,650. More restrained color options are available. Why the 2014 Cadillac CTS? While everyone else has been attempting to out-BMW BMW, BMW has been striving to make its cars more fuel efficient, smoother, quieter, and generally more appealing to non-enthusiast luxury sedan buyers. Consequently, the latest 5-Series, introduced as a 2011 model, communicates less and changes course with less agility than its ancestors did. This has created an opportunity for competitors to capture the hearts and minds of car enthusiasts. No one has taken fuller advantage of this opportunity than Cadillac. As it did with the related, smaller ATS, General Motors worked hard to shave weight from the new CTS. Tipping the scales at 3,770 pounds even with all-wheel-drive (AWD), the new car weighs about 100 kilos less than the BMW 528i xDrive. On top of this difference, the Cadillac's steering is quicker, sharper, and far more communicative than the numb system in the BMW, and its suspension motions feel more organically fluid yet also more tightly and more precisely controlled. Add it all up, and the CTS much more thoroughly involves and rewards the driver. This is one of those rare cars that just feels right, and driving it soon becomes second nature. No current competitor comes close in this regard. For maximum thrills you want the rear-wheel-drive CTS, preferably the Vsport which channels the 420-horsepower of a turbocharged 3.6-liter V6 through an active rear differential to help the car rotate (when you want it to). With all-wheel-drive the CTS retains some of the tail-happy dynamic character that leads enthusiasts to prefer rear-wheel-drive cars, but not quite as much as "xDrive" BMWs do. The week I had the AWD CTS Detroit-area roads were experiencing a new ice age, courtesy of the polar vortex. In the default and sport modes the car's stability control system cut in too hard for too long, causing nearly as much trouble as it prevented mid-turn. But switch to snow mode and the system handles slick surfaces almost seamlessly. The BMW doesn't have such a mode, but its stability control in its default setting automatically deals with slick roads nearly as well as the Cadillac in snow mode. The 2003-2007 CTS had a hard-edged, emotionally cold, PC-inspired interior that few people liked. The interior of the 2008-2013 CTS included an upholstered-and-stitched instrument panel, a motorized nav display, much more wood, and other dramatic upgrades. Nevertheless, it fell well behind the curve midway through the car's run. With the 2014 CTS, the interior has taken another leap forward in materials and craftsmanship. Much of the instrument panel and doors are upholstered and elegantly stitched. The trim options--aluminum, wood, and carbon fiber--are all the real deal. The last includes red highlights when ordered with the upgraded red leather. The touch-sensitive controls and vivid highly reconfigurable displays look expensive. The 528i's interior, though also comprised of premium materials, looks and feels utilitarian in comparison. If you want a luxury sedan interior that reeks of luxury, BMW wants you to step up to one of its pricier models, such as the related 6-Series Gran Coupe. In either car the doors pull shut with a reassuring whomp and the body structures feel rock solid. It's a Cadillac, so the tail lamps are vertical. I'm not a fan of the Bangled trunk. Shock and awe! Sadly, these controls don't work nearly as good as they look. Even the 6-Series Gran Coupe's interior doesn't pack the visual wallop of the Cadillac's. This cuts both ways. People seeking an aggressively stylish interior will find one in the new CTS. The designers didn't let any fears of excess get in their way. The longer you look, the more you notice--there's so much going on. If details piled upon details constitute luxury, this interior has luxury to spare. But others will find their visual cortex overwhelmed by the teeming multitude of trim bits and materials packed inside the Cadillac, arfully integrated though they may be. For these others, the business-like BMW might be preferable, and the tasteful minimalism of an Audi A6's interior might be nearly ideal. Other competitors from Infiniti, Lexus, and Mercedes fall between these two extremes, each in its own distinct way (organic curves, Tokyo-tech, and Euro-bling, respectively). Which car in this segment is most attractive ultimately depends on personal taste. An argument could be made for many of them. Unlike with the interior, Cadillac has dialed back its tendency to aesthetic excess with the exterior of the new CTS. I personally find the new exterior much less interesting than its bolder predecessors. But the new exterior is more elegant, and looks quite sharp from the front quarter. The LEDs that trace the leading edge of the front fender are an especially nice touch. The rear quarters are less fully resolved. Why Not the 2014 Cadillac CTS? Just as handling is the clearest strength of the new CTS, its controls are the car's clearest weakness. The touchscreen and other touch-sensitive controls pack a visual punch (at least until fingerprints smudge them up), but prove difficult to operate at a glance. The sought button is often hard to locate, and once located too often doesn't register the initial or even the second tap. Though they were human factors disasters in their first few iterations, the knob-based interfaces in the Audi and BMW are now much easier to operate. In the CTS, the button to switch among the chassis modes is located much farther rearward than in the BMW, so it's not nearly as easy to tap on the fly. The manual mode button's location on top of the shifter make little more sense. On the positive side of the ledger, GM's voice recognition could be the best in the business. Not only did it usually recognize spoken phone numbers correctly on the first attempt, but the nav system accepts the entire address in one chunk. This is much quicker and easier than separately providing street number, street, city, and state. The CTS's instruments can be configured in four different modes, with many additional options in each mode to vary the type and amount of information displayed. The five-sway rocker switches on the steering wheel could be less fiddly and more intuitive, though. Cadillac's earlier approach of operating the trip computer via the end of the turn signal stalk might have been less versatile, but it was much easier. Given the capabilities of these instruments, it's ironic that a comprehensive head-up display makes them largely redundant. Just about any critical information can be projected onto the Cadillac's windshield. With the 2011 528i, BMW pioneered the use of a turbocharged four-cylinder engine in a $60,000 midsize sedan on this side of the Atlantic. The point: fuel economy, specifically EPA ratings of 22 mpg city and 33 mpg highway even with all-wheel-drive (24/34 with RWD). Audi followed with an A6 2.0T good for 20/29 (25/33 with FWD) a year later. The new CTS takes the path blazed by the Germans, but much less effectively. Though the Cadillac weighs significantly less than the Audi or the BMW, its EPA ratings are lower, 19/28 (20/30 with RWD). The same is the case with the two 3.6-liter V6 engine options, even though unlike the turbo four they can be paired with an eight-speed (instead of a six-speed) automatic. The rear-drive-only Vsport barely evades the gas guzzler tax with ratings of 16/24. Even the 445-horsepower turbocharged 4.4-liter V8 in the BMW 550i does a bit better. In my real-world driving, the CTS's trip computer confirmed this shortcoming. Even considering that the outside temperature was near zero, post-warm-up averages that clustered around 18 were disappointing. Only by driving the car with a light foot could I nudge the suburban average over 20, and even then not much over. A 320-horsepower 3.0-liter 640i Grand Coupe tested a week earlier in similar conditions did at least one mpg better than the 272-horsepower, 2.0-liter Cadillac. And when I tested a 528i xDrive in slightly warmer temps it often managed 25 mpg (in an EcoPro Mode the Cadillac lacks). In one trip this BMW even touched 30. Less bold face, for broader appeal around the world. A couple more inches of rear legroom than in the ATS, but still feels tighter than segment average. Cadillac has also followed BMW's lead in ditching a spare in favor of run-flat tires. In the 5-Series this tactic pays off with 18.4 cubic feet of trunk space. In the Cadillac...not so much. Trunk space is a below-average 13.7 cubic feet. The windshield of the new CTS is set at a comfortable distance and rake, and the pillars flanking it are thin by current standards. But the good news with visibility ends here. A restricted view to the front corners can complicate confidently situating the car in its lane. In the other direction, some sports cars have larger rear windows. Gayla found it especially hard to see out of the 2014 CTS, and disliked driving it as a result. Many competitors, including the BMW, now offer multi-camera systems to aid with parking. Cadillac doesn't, at least not yet. Perhaps this shouldn't be necessary, as either car (when suitably optioned) can steer itself into a parking space. The first two generations of the CTS were "in between" cars larger than a BMW 3-Series but more compact than a BMW 5-Series. Contented and priced like the former, they weren't pitched as competitors to the latter. With the third-generation sedan this has changed. 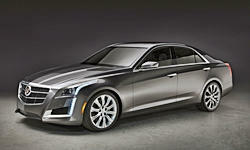 The new CTS leaves the 3er for the ATS and goes head-to-head with the 5er. However, the 2014's exterior and interior are only a bit more expansive than those of the 2008-2013 car. Also, the rear doors do not open wide enough for easy entry. You'll still find a roomier, more comfortable, easier to access rear seat in the 5-Series, even if the official specs suggest otherwise. Cadillac claims more peak horsepower for its turbocharged 2.0-liter four, 272 vs. 240 in the BMW and 220 in the Audi. In reality, though, the BMW feels at least as quick despite a combination of its lower peak horsepower spec and greater heft. (I've never driven the A6 2.0T, nor have I ever come across a road test of one.) The additional ratios in the BMW's transmission are part of the reason. But BMW also tends to understate the output of its engines, and this one has an especially plump midrange. While turbocharged four-cylinder engines are now powerful enough to quickly accelerate midsize luxury sedans, they can sound and feel out of character in the role. The BMW engine sounds oddly like a diesel at idle and under light loads. The Cadillac engine, in contrast, has the tenor of a refined four cylinder in casual driving. Not unseemly, but not sophisticated or suggestive of luxury, either. Rev the four over 4,500 rpm, and its voice becomes deeper and fuller. For a more luxury-class soundtrack (if still well short of the most spine-tingling), spend another $2,700 for the 321-horsepower (but less torquey) 3.6-liter V6. With the latest CTS, Cadillac has also managed to reproduce the ride quality of a BMW. In zero-degree temps on badly scarred roads, the car sometimes felt jiggly. The stiff sidewalls of the run-flat tires likely contribute to this, as they do in many BMWs. Switching the adaptive dampers into sport mode reduces the amplitude of ride motions, at the expense of some additional initial impact harshness. On reasonably smooth, evenly paved roads the car rides far better (surprising, I know). In general, control of body motions is better in the Cadillac than in the BMW. Even when jiggling across frost-heaved, pockmarked pavement the CTS retains the solid, thoroughly composed character found in the best cars. Front seats with adjustable bolsters are optional on the CTS Performance and standard on the CTS Premium. Anyone seeking lateral support will want these. The bolsters aren't especially large, but they are effectively firm and, when properly adjusted, get the job done. Initiallly the CTS's seats felt supportive, but not especially comfortable. My impression of their comfort improved each day I drove the car, though. This said, BMW's optional multicontour seats (not on the tested car) are better. They are more generously sized, a little more plush, and include more adjustments. Best-in-segment could be the front seats in the Lexus GS F Sport. The relatively flat, firm buckets in the Audi trail the pack. Detroit used to lead the world in gadgetry. In recent years, though, the Germans have surged ahead in microprocessors per car, while Cadillac fell well behind. With the 2014 CTS, the widget gap has been narrowed considerably. Perhaps 90 percent of the features available on the 528i are also available on the CTS. Some features, most notably the reconfigurable LCD instruments, aren't even offered by BMW, at least not yet. But the CTS lacks a hold feature (so you can take your foot off the brake at traffic lights), an around-view camera system, power-folding mirrors (de rigueur in Europe, and now available on most Kias), power door closers, a power trunk closer, massagers in the front seats, and so on. The CTS used to also fall in between the 3-Series and the 5-Series in price, and much closer to the former to the latter. The 2014, though, lists for over $10,000 more than the 2013. It costs about as much as the BMW when both are lightly equipped, but gains an advantage when options are piled on (BMW charges more for options). Though the tested car had the base engine, it listed for $67,285. Remove features not offered on the BMW, and the bottom line would still total $63,565. Seem steep? Unfortunately, it's now the price of admission to this class of car. A similarly loaded 528i xDrive would sticker for $69,225, $5,660 more. Audi doesn't offer the full spread of the A6's options with the 2.0T engine. Add those that are offered on both cars, and the Cadillac is about $5,000 more before adjusting for feature differences, and still about $2,000 more afterwards. Lexus offers only a V6 in the GS. Add one to the CTS, load up both cars similarly, adjust for the additional features on the CTS (some features including rear climate control and rear seat heaters aren't available on the GS 300 F Sport), and the two end up very close in price. Before the adjustment, though, the Lexus stickers for $2,105 less. If you can live with marginal rear seat room and trunk space, the related Cadillac ATS lists for $11,575 less before adjusting for feature differences, and about $8,800 less afterwards. A final pricing note: Owing to a quirk in the CTS's pricing structure, the top trim level lists for a few hundred dollars less than a Premium optioned to the same level. So if you want a CTS equipped like the tested car, with fancy instruments and the polished alloy wheels, get the Premium. A simple tally will find more negatives than positives for the new CTS. But simple tallies are silly, which is why I don't do them. With the arguable exception of the controls the negatives won't be deal killers for many people, while the new Cadillac is significantly more engaging and enjoyable to drive than any direct competitor. The overall impression when behind the wheel is "damn good car," and far better than Detroit seemed capable of even a couple years ago. If you want to enjoy your time behind the wheel of a midsize luxury sedan, you must at least take the new CTS for a test drive. Quick enough for nearly all drivers, but not as quick as the specs suggest it ought to be. As in the ATS, handling a much higher priority than trunk space when designing the rear suspension. Cadillac provided an insured CTS AWD 2.0T for a week with a tank of gas. BMW did the same with a 528i xDrive. A CTS Vsport was driven at a media event. 2014 Cadillac CTS pros and cons, according to Michael Karesh: the best reasons for buying (or not buying) the 2014 Cadillac CTS. Join TrueDelta to post your own impressions.